It can be fairly said that the Zandalari have endured for many thousands of years, and that in all that time, much of their history has been forgotten. Dating all the way back to the original, singular Troll Empire that covered much of the world, moving onto the breaking away of the Amani and Gurubashi tribes, then further progressing to the war with the Aqir that left modern-day Vol’dun a blasted sandscape, there have been many rulers and many eras in Zandalar history. Frankly, more than we can cover in a single Know Your Lore article. But we can at least start scratching the surface. Last week, we talked about Zul the Prophet. This week, we talk about the god he chose for his people — a dread thing, a force of corruption and madness that nearly destroyed all Troll civilizations at the dawn of time. 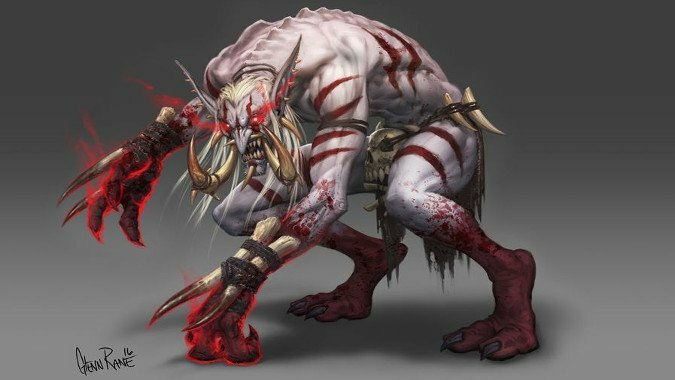 This week, we talk of G’huun, one of the two Blood Gods, and a terrifying deity of the Blood Trolls who would infect the entire world with its decay. This post contains spoilers for the Horde storyline in Battle for Azeroth. Before they came to rule in Dazar’alor, the Zandalari lived in Zul’Nazman. At that time, rather than a festering, drowning bog, it was a lush forest and the seat of Zandalari power. 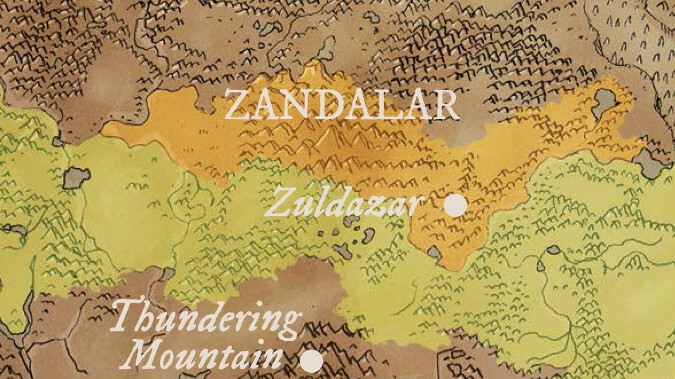 The Zandalari did not live on an island at all, but rather a large territory around the holy mountain of Zuldazar. Even after the Amani, Gurubashi, Drakkari, and other tribes of Trolls declared themselves to be independent of Zandalar’s rule, the Zandalari were viewed as religious leaders and held great influence among the other tribes — for there were holy secrets in the heart of the Zandalari territories. Three of these secrets were the Great Seals. One of them in the wilds of south Zuldazar, another in the fertile lands to their north (now called Vol’Dun), and a third in the forests of Nazmir. These three seals would attract the Trolls to them, and they would build temple cities around the pyramids that contained the Seals. Why? Because the Seals were left behind from when the Titans shaped Azeroth, and they were tied into the great complex of Uldir — a very special facility, indeed. Some Titan complexes served as prisons, but Uldir was originally a research complex studying the true nature of the Old Gods. 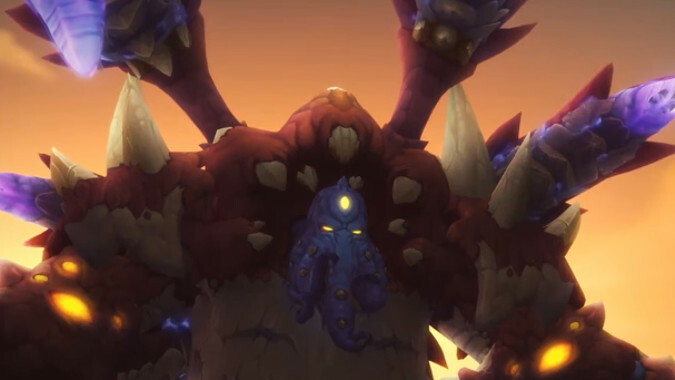 Seeking to find a way to destroy the Old Gods without further damaging Azeroth — as had been the case when Aman’Thul tore Y’Shaarj from the planet’s surface — the Titan-Forged constructs of Uldir instead created a monstrous thing. Studying the innate corruption of the Old Gods — using samples taken from the ones held captive in other facilities like Ulduar and what would become Ahn’Qiraj — they failed in their mission to discover a way to end the Old Gods. But they succeeded in creating a new one, one that embodied the corruption of the Old Gods as an infection, a creature of malevolent, intelligent decay and rot. In order to keep studying the creature while preventing its escape, the entire complex was locked down using the three Seals. Over time, the Zandalari discovered the Seals and studied them. While they didn’t learn much, they did create their own civilization, one that respected the many Wild Gods and other spirits attracted to Zuldazar by the power of the Titans who had once walked the land. They called these beings Loa, and they entered into compacts and alliances with them. In time, these Trolls grew the first native-born Empire on the face of Azeroth since the Elementals fell in battle to the Black Empire. Of this Empire we know only a little. We know that the C’Thrax Kith’ir eventually raised an army of Aqir against it, and the Zandalari enlisted the aid of their Loa in this titanic battle. They even went so far as to send their most ambitious tribes to hunt down and slay Kith’ir, and in so doing sowed the seeds of their own lost empire. For the Gurubashi and Amani that were sent out by the Zandalari ultimately rebelled against them after Kith’ix was slain and the Aqir defeated. Zul’Aman itself was erected over the corpse of Kith’ir and populated by those Amani that managed to survive their battle with the C’Thraxxi warlord. The Zandalari might have been able to punish their recalcitrant subjects if not for the coming of Mythrax, another of the C’Thrax who served G’huun. It’s unknown how the Blood God contacted him from within its prison, but Mythrax laid siege to Vol’dun, and in time, it reached the pyramid of Atul’Aman. With the Amani gone, the Loa, Sethraliss, sacrificed herself to destroy Mythrax but did not manage to stop him from destroying the Seal in the pyramid. Their conflict rendered Vol’dun nearly lifeless. In the wake of this disaster, the Zandalari simply didn’t have the strength to reclaim command of their old tribes, and instead accepted a role as elder statesmen and religious figures that all Trolls would respect and listen to. While we have the basic story of what happened at Atul’Aman — the Zandalari and Sethrak forces were mostly destroyed, Sethraliss sacrificed herself to stop Mythrax, the Seal was destroyed and the jungles became desert — we know less about what happened in Zul’Nazman. We know that the pyramid Atul’Nazman containing one of the three Seals keeping Uldir safe resided here, as did Titan Keeper Hezrel, who spent eons watching over the Uldir complex while Zul’Nazman grew around it. And we know that for a time, Zul’Nazman was the seat of Zandalari society, the greatest of their cities. Before they had a King or an Empire as such, they resided in Zul’Nazman. 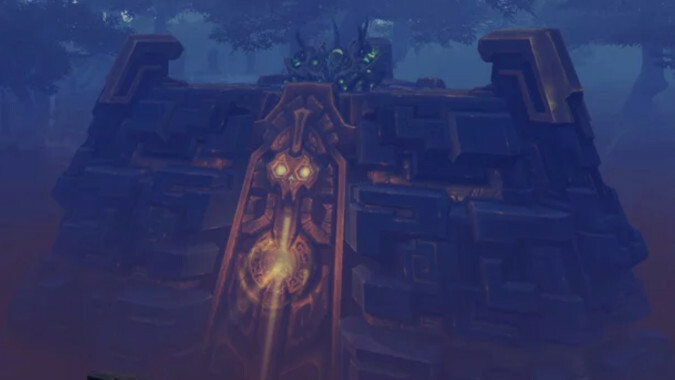 Based on stone tablets that still endure in Nazmir, the corruption of G’huun was not fully contained. Over time, it reached forth from its prison, warping and twisting the land around it. Rather than risk remaining, the Zandalari followed Dazar and fled the steadily growing corruption, leaving Zul’Nazman behind — and Uldir sleeping fitfully at the heart of the slowly decaying ruin. When exactly this happened — and what form of state the Zandalari had before Dazar led his people to what is now called Dazar’alor — isn’t clear. But after Dazar, the Zandalari were ruled by a line of kings. How long before the rise of the Kaldorei Empire and the defeat of the Amani and Gurbashi is unknown — but all the trappings of modern Zandalar were in one way or another taught by Dazar. And left behind, the Zandalari slowly forgot the origin of their people — the lost glories of Zul’Nazman, the pyramid Seals of Atul’Aman and Atul’Nazman, and Uldir in the very heart of their city holding G’huun. Hezrel lay forgotten, mistaken for a statue. 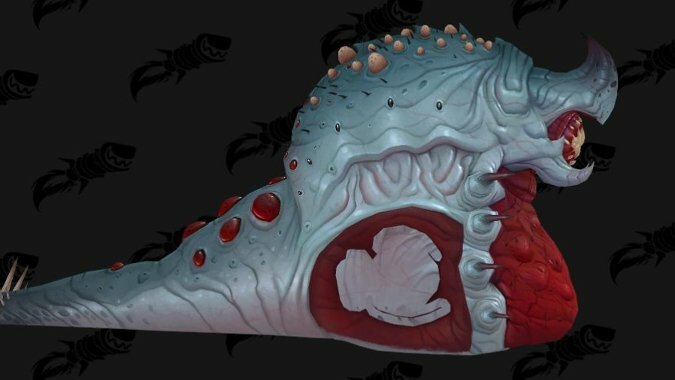 G’huun was patient — patient as only a force of pure decay can be, for rot does not have to hurry. Everything comes to it in time. The Sundering of ancient Kalimdor left Zuldazar an island, and G’huun continued to wait. When the Cataclysm happened, one of the consequences — and almost certainly a planned one — was that Nazmir was nearly destroyed. Atul’Nazman was heavily damaged, the Seal within it destroyed, and much of the region began sinking into the sea. With two Seals destroyed, G’huun was now within striking distance of freedom. To achieve it, the pseudo-Old God turned to two unlikely sources — the fanatical Blood Trolls and the crafty Zul. But who were the Blood Trolls, and why did they worship G’huun in the first place? That’s for next week.